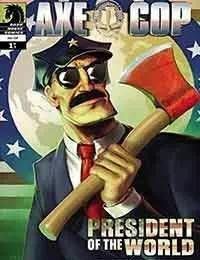 Axe Cop has been appointed president of the whole world! But what will Axe Cop and his friends do in a world with no bad guys? Look to defeat the bad guys from outer space, of course! Written by 8-year-old Malachai Nicolle and drawn by his 31-year-old brother Ethan Nicolle, Axe Cop is commander in chief of hilarious adventures as only a kid could imagine! Upon its debut as a webcomic in December of 2009, _Axe Cop_ was instantly hailed as a one-of-a-kind hit! **Elect Axe Cop!